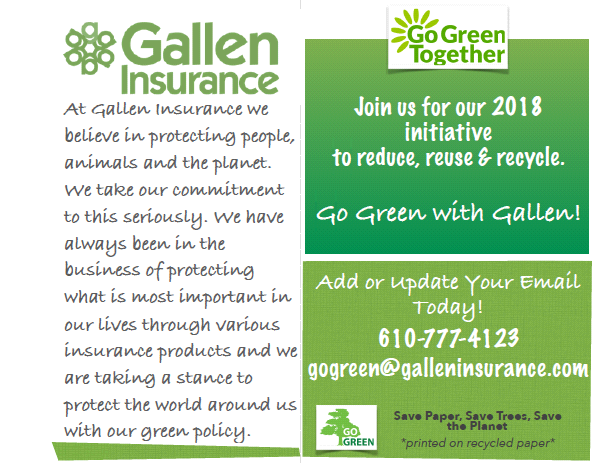 At Gallen Insurance we believe in protecting people, animals and the planet. We take our commitment to this seriously. We have always been in the business of protecting what is most important in our lives through various insurance products and we are taking a stance to protect the world around us with our green policy. Recycling and reducing is our main component in going green. We strive to reduce paper in operations by scanning and shredding paper. Communicate to customers, insurance carriers and vendors whenever possible by email and electronic newsletters. Policy and endorsement delivery for all clientele being delivered via email whenever possible. Always avoid printing paper if possible.